Did you know? It is Veterans Health Administration (VHA) policy that medical ID bracelets and pendants must be available for qualifying veteran patients. Medical IDs are ordered by your VA doctor and provided, courtesy of your VA Prosthetics Department. *All orders must originate through a VA Medical Center or VA Clinic. Download your medical ID order form. Please note this is optional, as the form is not required. Discuss your medical condition with your VA clinician, VA educator or other VA healthcare provider and determine what should be engraved on your ID. Your VA clinician will submit your order. 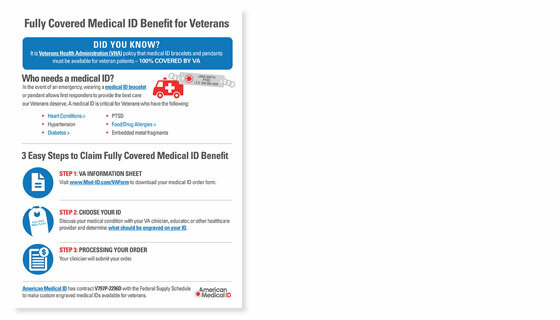 Medical IDs are important, especially for veterans living with chronic medical conditions or those who suffer from injuries. In the event of an emergency, wearing a medical ID bracelet or pendant allows responders and health care professionals to provide the best care our veterans deserve. For veterans and their families, having a medical ID allows them to enjoy and live life with peace of mind. If you have any additional questions about how to get your free medical ID, call us at 800.363.5985. Spread the word to your fellow veterans about this benefit. 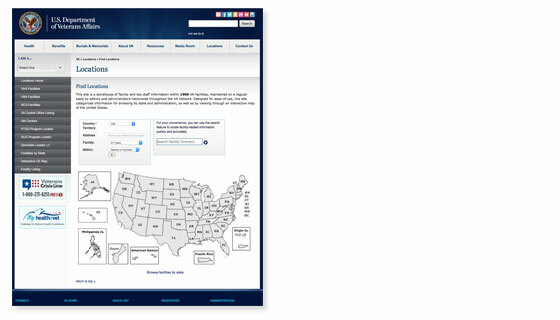 Find a VA Clinic near you. 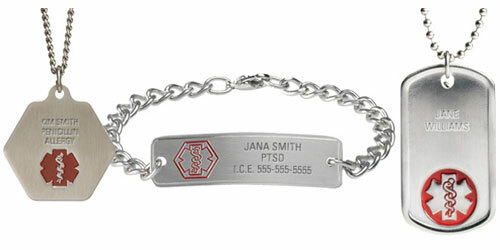 American Medical ID, a small business, has contract V797P-2296D with the Federal Supply Schedule to make custom engraved medical IDs available for veterans.